As the New Year pulls me gently and forgivingly out of a wonderful holiday slumber, and as the Winter Solstice marks the lengthening of days once again, it seems a right and good time to reflect upon the unique winter fruits we've been enjoying - on many levels - here at Delphi. Our pomegranates (Punica granatum) have, for six or more weeks now, been harvested, stored and continue to sustain us. Pomegranates have enjoyed a sort of consumer-come-back in the nutrition world in recent years. I am fully on board with touting their health benefits but they are also one of the most ancient and mythologically important fruits that I know of. They appear in Greek mythology, have been discovered in Egyptian tombs (including King Tut's), and were carried by ancient Persian soldiers under Xerxes' rule, on the tip of spears in the place of spikes, when they invaded Greece in 480 BC. Nutrition-wise, pomegranates can be juiced quite easily and, especially when said juice remains unpasteurized, this can serve as a powerful anti-parasitic tonic. Pomegranates are incredibly antioxidant-rich and contain extremely high levels of polyphenols and flavinoids, both known to offer protection from cancers and heart disease. When I first moved to California and really discovered the joy and potency of a pomegranate, as well as the beauty of growing them in a garden setting, I would describe the cleaning and eating process to my young nephew as a way to uncover "jewels:" small, bright and juice-covered seeds guaranteed to mark one's hands, and any clothing, a deep and brilliant red color. I've enjoyed sharing pomegranates at the Thanksgiving table, the small seeds substituted for the East Coast's traditional cranberry sauce. Historically speaking, this treasured fruit plays a prominent role in the ancient Greek myth of Persephone, Goddess of the Underworld. As it is known, Persephone, whose name means "she who destroys light," or "the inspirer of death," was the daughter of Zeus, God of all gods, and Demeter, his sister, Goddess of the harvest. Persephone was a beautiful young woman, sought after by many. Haides, God of the Underworld, was especially attracted to her youthful light and innocence. He took her, quite literally, by emerging from a crack in the earth and bringing her to his underground world. Zeus was aware of her abduction and even coordinated it in cohorts with Haides. Demeter was not privy to this deal and became utterly devastated and confused upon the lose of her daughter. Demeter left her temple to roam the whole earth searching for Perspehone. When Demeter finally learned that Zeus knew about their daughter's abduction she refused to allow anything on Earth to fruit until Persephone was returned. Zeus consented to Persephone's return, in part because the agricultural system was completely falling apart, and humans and Gods alike were getting furious about this. Because Persephone had tasted the food of Haides' Underworld -- a small handful of pomegranate seeds -- she was forced to continue to spend a part of the year with her husband, underground. Her annual return to Earth happens in the Springtime, along with the flower blooms and new plant growth. Her annual decent occurs when vegetation ceases, or goes underground, every year. Persephone's story symbolizes the cycle of death and rebirth in nature. As she matured into the respected wife of Haides and became, truly, the Goddess of the Underworld, she further embodied the role of Great Balancer which, indeed, we all know our Mother Nature to be. The figure in this painting, called 'Prosperpine,' is the Roman name of the mythological figure Persephone. The artist Dante Gabriel Rossetti painted this in 1874 and the original is housed at the Tate museum. Symbols contained in the painting include the pomegranate, which signifies captivity and marriage, and the incense-burner, the attribute of a goddess. Another winter fruit we've enjoyed without end - purréed and folded into sweet breads, baked in puddings, and as table fruit - is the unique and rather mysterious Medlar. Mespilus germanica is a member of the Rosaceae Family, typically grafted on to hawthorn or quince rootstock. It is a pome fruit, like apples and pears. What makes this fruit wildly interesting is that it needs to "blet" in order to be eaten raw. This process takes two to three weeks in storage in a cool, dark, frost-free place. We were able to allow our fruit to NEARLY fully blet, and therefore develop the most flavor, by staying directly on the tree. One can determine the fruit's proper readiness by looking for soft, brown flesh. It tastes almost of something tropical and has large, smooth black seeds within that add to its curious profile. I'm not prone to eating large quantities of the fruit but really do enjoy how majestic and unique it is. 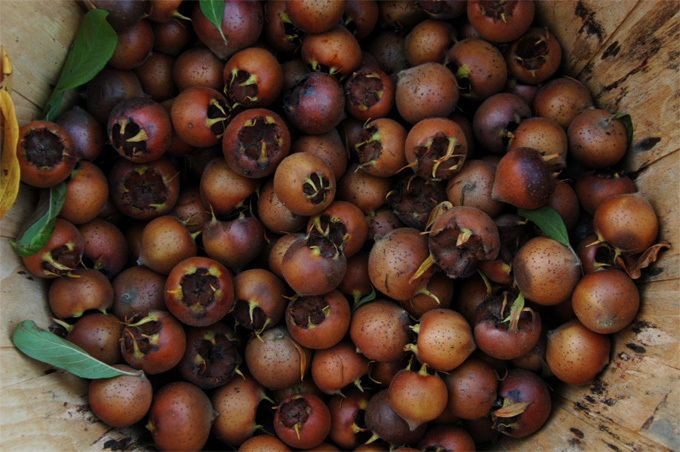 And, of course, we love medlars because they are one of our latest ripening fruit sources on the farm. 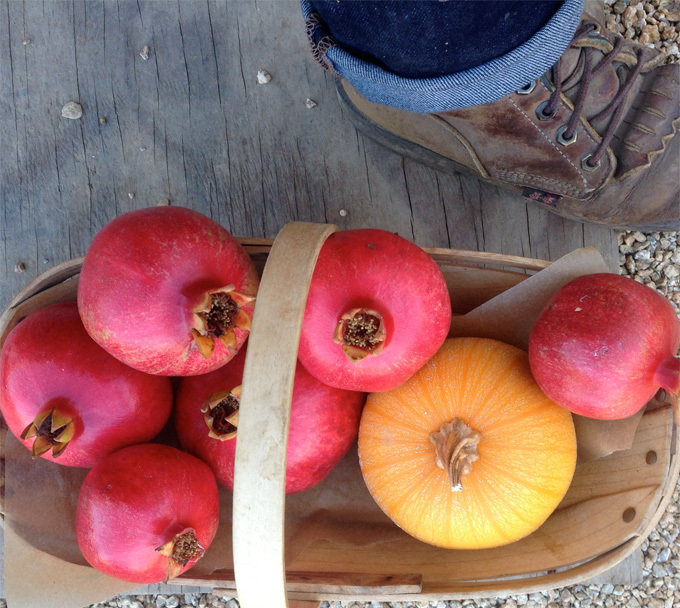 The Fuyu and Hachiya persimmons add such necessary color to our winter fruit collection. Their bright orange orbs on leaf-fallen trees in mid-December, which is just around our final harvest date, are stunning. Additionally, there is a very late ripening apple on our multi-grafted apple tree that I've been unable to identify. It is tart and firm, beautiful, fragrant and delicious. I am including a photo of it below: please leave a comment if you can identify it! 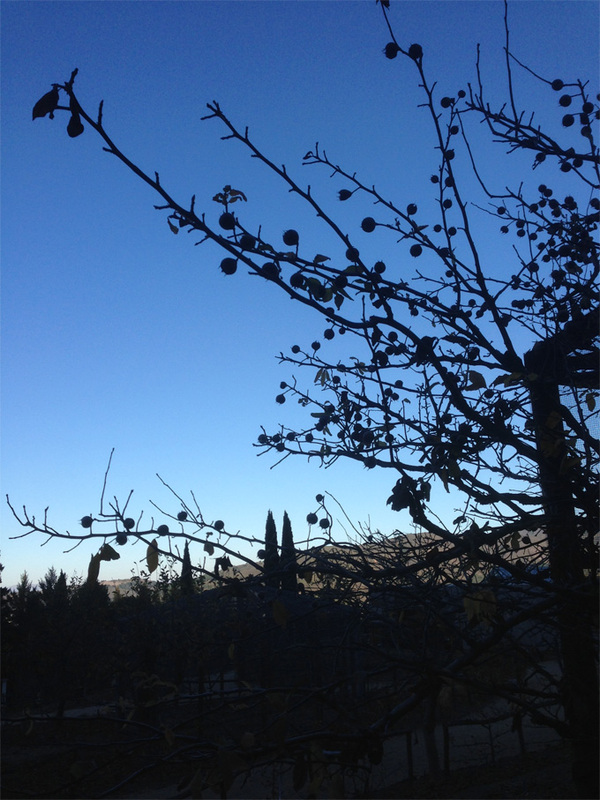 And, lastly, this piece on winter fruits would simply not be complete if I did not mention our olives. They are being washed every day now as part of the hand-curing process that we practice at Delphi; the oils visible in the water that is changed out along with remnants of pale purple from their ripe, plump flesh.